Well…I weighed in this morning and to say that I’m frustrated is almost an understatement. 172.2 AGAIN! Ugh! What do I have to do to lose a pound?!?!?! Maybe I’m being too strict with my food…I don’t know. I know I’m not overdoing it on the exercise. I took 2 rest days this week…Thursday and today. I’m just going to keep watching what I eat and continue to exercise like I have been. The results will eventually come, I’m sure. I hope. I was so frustrated yesterday morning that I wanted to stop and get a fast food breakfast sandwich on my way to work (I’m working that double shift with the day shift and then my regular evening shift…16 hours). Instead, I stopped at a convenience store and got a thing of fruit instead. I would have regretted my decision had I gone with my first thought and gotten the breakfast sandwich with all its fat and empty calories. I’m glad I was able to make the healthier choice. So, since I spent 16 hours at work yesterday...pretty much my every waking moment…I had to get all my food ready and take it ALL with me when I left for work this morning. I stopped at the convenience store for the purpose of buying a couple 5 hour energy shots. I had to also buy water and a Gatorade because I forgot to pack anything to drink when I left home. Dammit. So, shortly after I got to work, I ate that thing of fruit I bought when I stopped for the 5 hour energy shots. I must say I was a little weak when offered a small slice of homemade pepperoni pizza at 8am. It was really good and it was a small piece. Around 8:30am I ate my oatmeal (cinnamon flavored with pecan pieces, stevia and almond milk). At about 11, I was going to eat my banana; however, I also wanted to go to Starbuck’s for a skinny iced coffee and decided to grab an orange cranberry scone to nosh on. 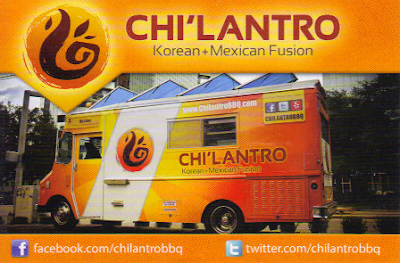 Something else I decided…there’s a food truck called Chi’lantro parked in the park across the street from work today. It’s Korean and Mexican fusion. I got the kimchi fries with pork bulgogi and a beef bulgogi burger…with an over-easy egg on it! Yum! That was around 3:30pm. Then, I didn’t eat anything else the rest of the day until I got home, where I ate some molasses salmon before going to bed. It was early to bed with me last night because this morning was Run With The Heroes 5K (race report coming soon!). I’m so happy that they are offering morning of packet pick up. If they weren’t, I wouldn’t have been able to pick up my packet because the pickup location was too far away from work for me to go on a lunch break to get it. I wore my “Team Sheriff” shirt because it’s a Sheriff supported event. I decided I’m going to wear my “run like criminal” headband because it would be funny and a little ironic for me to wear that paired with my “Team Sheriff” shirt. Teehee.